SINGAPORE, October 14: Superloop has partnered with Prysmian to deploy optic fibre to a commercial high-rise building in Singapore’s CBD using an innovative solution that significantly reduces the total cost of ownership on multi-dwelling unit (MDU) projects. 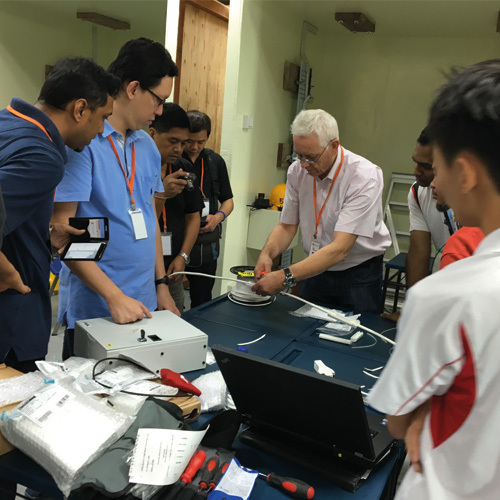 The recent project — the first VertiCasa cable deployment in Singapore — involved a combination of on-site training from Prysmian, and the installation of a 48-fibre core backbone. Prysmian’s VertiCasa is a dynamic solution which enables fast installation, can be adapted to different scenarios and keeps labour involvement to a minimum. Superloop installed sufficient cable capacity to potentially connect 48 services in the building from day one. The VertiCasa cable has an outside diameter of 9.5 mm taking up minimal space in riser shafts. Once installed the cable is then branched directly to each subscriber on different floors when a new connection is required. With VertiCasa the required length of protected ‘easy strip’ fibre is extracted from the backbone and routed directly through to the end user. A pre-connectorised drop cable can be used to provide the final customer connection. “VertiCasa is suitable for any type of building, low, medium or high-rise,” said Mr Rando. For further information please contact Prysmian or visit: www.prysmiancable.com.au. Prysmian Australia Pty Ltd is part of the Prysmian Group, the world’s largest cable manufacturer with almost 140 years of experience, sales of about €7.5 billion in 2015, over 19,000 employees across 50 countries and 88 plants. The company produces over 7 million kilometres of cable a year in Australia and New Zealand. With 3 state-of-the-art plants in Liverpool (NSW), Dee Why (NSW) and New Lynn (NZ) Prysmian Australia offers the most comprehensive range of energy, data and telecommunications cables for customers throughout Australia, New Zealand and export markets. Prysmian Australia has over 450 employees, is in possession of 9 warehouses across Australia and New Zealand. The Dee Why plant is the largest fibre optic manufacturing facility in the Asia Pacific region, allowing the company to offer tailor made solutions to satisfy specific customer needs. Established in 2014, Superloop is quickly becoming one of the leading independent providers of interconnection services in the Asia Pacific region. The company owns and operates fibre networks in Australia and Singapore spanning over 300km and connecting over 48 of the region’s key data centres. The network is continually expanding with further extensions currently underway to connect the Singapore Exchange, iO and NTT data centres in Singapore. In Hong Kong, Superloop is establishing a 110 km fibre optic network connecting 30 strategic sites including the Hong Kong Stock Exchange data centre, and is on track to commence operations in December 2016. Additionally, the company is constructing TKO Express, the first submarine cable to connect the traditional carrier hotels located in Chai Wan on Hong Kong Island and the data centre campus located at Hong Kong Science and Technology Park’s Tseung Kwan O Industrial Estate on the mainland. This provides much needed physical diversity and a lowest latency path between Hong Kong’s major finance and technology hubs.